Mandrakes appear throughout Davidson's writings, from the carefully restrained mandrake Vergil employs to find a favorable wind on the sea voyage to Cyprus in The Phoenix and The Mirror, to his definitive essay "Who Makes the Mandrakes?" in Adventures in Unhistory. Some digressions relating to this unusual plant follow. As serendipity is itself a phenomenon which interested Avram Davidson, I include a section of an article which came across my desk at work when I was reading Adventures in Unhistory for the first time (shortly after Davidson's death in May 1993). Leaves turn into an underground stem called kaudex and then to a crooked tuber up to 5 kgs by weight which often looks like an ugly little man. Ripe berries are edible and taste not unlike a green tomato, smelling like strawberries, melons and hippophae. Berries contain a great deal of various alkaloids including narcotics; thus eating green fruit may cause poisoning though not death. One of the reasons that the plant had not got into the field of botanists was its unusual vegetation -- it is in blossom in Nov. or Dec. and bears fruits in Apr. or May. It can be accounted for by its relict characteristics : the plant dates back to the flora of the Tertiary era. Strange are the attributes that man has bestowed on the mandrake. From early times the learned have written about this plant, which flourished in the wheat fields of Mesopotamia during the days that Jacob tended the flocks of his uncle Laban. Among its several properites, the mandrake was supposed to promote conception. When Reuben brought them to his mother, Leah, Rachel said : "Give me, I pray thee, of thy son's mandrakes." Up to that time Rachel had borne no children. Throughout the east the mandragora was used as a narcotic ; sometimes as a sleeping-draught. In Shakespeare's play, Cleopatra cries out: "Give me to drink of mandragora" ; and states as her reason for doing so, "That I might sleep out this great gap of time, My Anthony is away." The likeness of its forked root to the human body caused Pythagoras to call it anthromorphon ; and through the herbalists distinguished the sexes, Sir Thomas Browne in Pseudodoxia Epidemica deplores the custom prevalent in several parts of Europe of selling the roots to ignorant people. He cites the superstition that it was "an hazard of life to them that pull it up" and of how, when thus torn from the ground, the plant would give a shriek. That living mortals, hearing them, run mad. And then Sir Thomas mentions the method given by Pliny : ". . . when they intended to take up the root of this plant, they tooke the wind thereof, and with a sword describing three circles about it they digged it up, looking toward the West." So dangerous was this operation that a dog was sometiems employed. After the dog had been tied by a cord to the plant, the earth was loosened about the roots. In his struggles to free himself, as Josephus tells us, "he will tear up ye roote whych by its dreadfull cryes wyll kyll ye animal." Amongst the exquisite engravings to be found in Florilegium Renovatum et Auctum by Johannes Theodorus de Bry, eldest son of the famous German engraver, and published at Frankfort-on-Main in 1641, is that of the Mandragora fæmina. [ A larger image of de Bry's plate of Mandragora fæmina ] It must be a pretty plant, with dark green leaves, white flowers, stained with veins of purple; and pale orange fruit, called "apples of love" by the ancient Greeks. 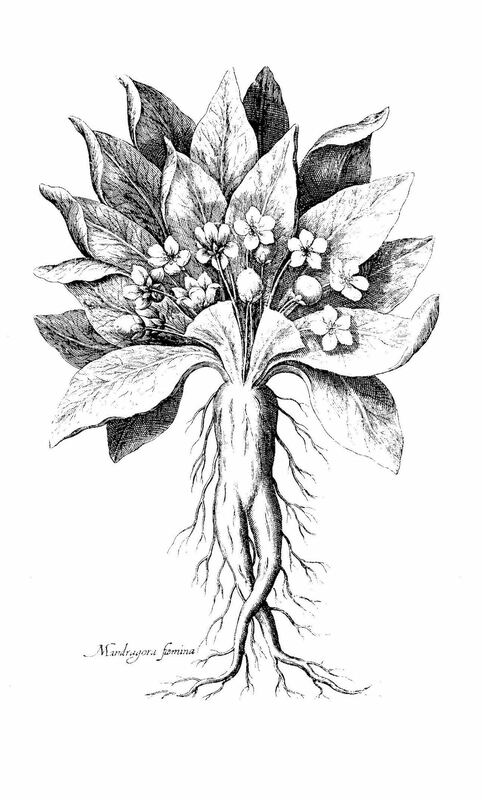 Little wonder that witches used the root of the mandrake to concoct their potent wine, for the plan is closely allied with Atropa belladonna, the deadly nightshade. Readers of "Who Makes the Mandrakes?" will note that many allusions and sources in Biddle's brief discussion parallel those of Davidson four decades later.